It does, it really does. Cat pee stinks. In the last year our cat has taken to peeing on anything in our bedroom. The carpet, the bath mat, the clothes laying on the floor, blankets. Anything. But mostly the carpet. And sometimes the puppy pads, but never her litter box. And let me tell you....cat pee stinks. And it's hard to get out of carpet. As the humidty rose, we kept smelling cat pee as we would sleep. It's not pleasant. And the other day when we came home, our house reeked like a zoo. So Biker Boy ripped the carpet out of our room. That's how we spent the Fourth of July. Oh, he also worked. The kids and I went to the zoo and visited Biker Boy for lunch. We had a fabulous dinner and as the kids enjoyed cupcakes, Biker Boy went to town ripping out that foul smelling carpet. And the cat got banished to the outdoors. Or the garage. But she'll rarely venture in the house anymore. Look at the first piece of carpet ripped up. See all those dark colors on the underside. Cat Pee. Yuck. And we found more foul spots as the carpet was ripped up more. Cat Pee. Yuck. Eventually we were left with bare concrete. With large cracks in it. I promptly ordered 2 radon test kits, which we get discounted through our county. We're betting we have radon and will have to get a radon evacuation system. I'm avoiding thinking about how long those cracks have been there since the house was built nearly 7 years ago. We had originally thought of staining or painting the concrete and living with that as a floor for a bit. But the big cracks and uneven level of the concrete nixed that idea. Plus the huge gaping holes left from the carpet nail strips weren't appealing to fill in. So today we went shopping for wood flooring. Lucky for us that we did this on the Fourth of July weekend so we could hit the sales. We checked out Costco. They have some decent and cheap laminate flooring there. But it seemed a little thin to us and too shiny for our taste. Then we headed to Lumber Liquidators. They had some laminate very similar to the kind at Costco, but it was about 40 cents more a square foot. So get it at Costco if you're looking for that kind. We were looking for a floor with a little dimension and depth to it. 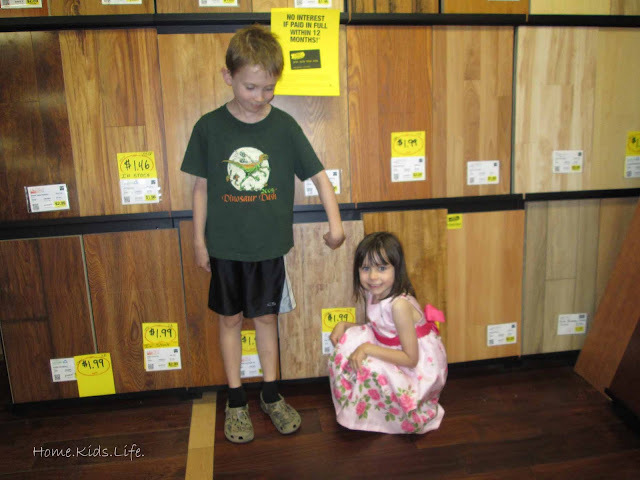 We really liked the Bamboo flooring, it's super durable, but it's also a little spendy. The cork flooring was appealing, but we gravitated towards the laminate. I immediately picked out 2 colors that I liked. They just happened to be manufactured by the same company. But I couldn't decide which one I liked the most. One was golden, while one was gray. I like gray. But I also liked the hickory golden one. (Hmmmm...I have lots of gray walls going on in my house, plus hickory cabinet....go figure.) Here's the kids by the 2 choices in some poorly taken photos. And the winner...well, first we asked what was in stock. One was in stock and the other could be shipped to the store in 2-3 weeks. We need this project done in 2 weeks. So the winner was the golden one (the top one). The kids watched as we put 11 boxes on the trailer. We were going to get 12 boxes and just bring one back if we didn't need it, but alas....Lumber Liquidators charges a 20% restocking fee for unopened boxes. Say What?!! So we put back one box and we'll just have to drive the 30 minutes to town if we need another one. That's the downfall of Lumber Liquidators in my opinion. Restocking fee for an unopened box...not good. It had poured rain on us as we were driving to the stores, but fortunately stopped on our way home with the fake wood. We did wrap it in a tarp, just in case. Now Biker Boy is trying his best to even out the concrete floor in our room so the laminate can lie pretty flat. It's a dusty mess in there. He's got a dust mask on, knee pads on, fans blowing stuff out the window, and a fan blowing into the room. My hero! Oh, I even get to repaint the room. Just when we get our house out of chaos after painting the homeschool room, we put it back into chaos with working on another room. So we get to sleep in the living room. With the cat meowing outside all night. Great. But at least I'll have a pretty new room in which to do portraits! Gotta look on the bright side. If your cat starts to pee inside and often, get it checked by a vet. It could be diabetic. Many cats become diabetic as they age. Our cat was peeing everywhere because she was diabetic.